If you're worrying about anti-ageing then we've got one message for you - PLEASE don't just fixate on your skin. The key to a healthy, young looking (and feeling) body is to nurture yourself on the inside and the outside. In a nutshell it all comes down to diet. If you want to know the secrets to ageing well, these are the foods that will keep your body young both inside AND out. We spoke to a whole load of registered nutritionists to get their insider knowledge on their favourite foods for anti-ageing. From fruits to grains and all things in between, if you can work these foods into a healthy, balanced diet then your body will be prepped and primed to age as well as possible. Clinical Nutritionist Suzie Sawyer is currently working with Nature’s Way and has a wealth of knowledge about health foods with body (and beauty) boosting benefits. She says, ​"Your body needs around 40 nutrients each day from a variety of foods for optimal wellness. However, one great rule to follow is to try to eat a ‘rainbow diet’. That means, trying to make every meal as colourful as possible. It is the deep colours in foods that provide the real wealth of nutrients." Here are the 25 foods you need to help keep you feeling and looking younger (and stronger) for longer. We can't stress enough how good avocados are for you - plus out of all the greens you can get, in our opinion this one tastes the best! Fennel is becoming a much more common health food and for good reason too. Geeta says that fennel "is packed with dietary fibre that will help you flush out toxins and boost digestion," which will help the ageing process. Papaya is one of the most underrated fruits for promoting good health. Eating a portion of this a day is incredibly good for your skin and hair and it also helps prevent illness. Simple's nutritionist, Fiona Hunter, says this is all because "papaya contains a phytochemical called lutein which helps to boost the antioxidant capacity, which can help protect against free radicals and slow down the progress of ageing." Cucumber is good for just about everything when it comes to beauty and health, but because of its re-hydrating and remineralising qualities it is also amazing for anti-ageing. Its anti-inflammatory properties are particularly good for keeping skin looking young. Add it to your diet now! If you see your colleagues drinking hot water and lemon EVERY MORNING, they're onto something. Geeta says that just one cup of hot water and lemon "balances your pH, flushes the system and hydrates and oxygenates the system." Beetroot is delicious yes, but did you know it's perfect for anti-ageing too? Geeta explains that beetroot "is a great source of betacyanin, which is anti-inflammatory and it’s full of magnesium, iron, zinc and calcium to help flush out toxins." As inflammation is the enemy of ageing well, these little red beets are a god-send. Eating spinach isn't just about getting a good dose of iron. One study in the Journal of Neuroscience reports that spinach can combat cognitive decline and as such, can help stimulate the brain and mental alertness in old age. It's also packed full of vitamins like A, B, C, D, and K which especially help to have youthful skin and strong bones. ​Geeta says that spinach is also great as it "reduces the risk of certain cancers, including cancer of the liver, ovaries, colon, and prostate." We all know that sugar is the enemy of ageing well, so when Geeta said that broccoli "alkalizes, detoxifies, and reduces sugar levels," we were pretty happy. ​As well as broccoli containing quercetin, a powerful antioxidant, it also contains powerful anti-inflammatory ingredients, which are extra important as inflammation is the number one cause of ageing. Research also shows that the glucoraphanin found in broccoli also super-boosts your metabolism. Time to get on board with broccoli. Studies show that purple coloured foods are an excellent source of antioxidants. They help prevent things like cancer BUT also simple things like wrinkles too. Win, win. Expert nutritionist, Dr Sam Christie from Nature's Best, says that protecting your skin from the sun is one of the best ways to delay the ageing process and as well as the all important SPF protection, berries are an excellent place to start. "Go for all things black or purple in terms of berries and fruits (blackcurrants, blueberries, figs etc) for skin protection. These plant foods use their own colouring pigments (polyphenols including anthocyanins (ATCs)) to protect themselves from harmful sun rays. It's a bit like the plant's own sun cream - only the protection is from the inside." "This emerging area of dermatology (known as photo biology), where what you eat looks influences how you cope with sun damage (i.e. how much redness, wrinkling etc you suffer with) has recently revealed that eating these plant colouring compounds lead to a degree of sun protection. You'll need to munch through around 50g (25 berries or so, or 2 dried figs) daily." she explains. 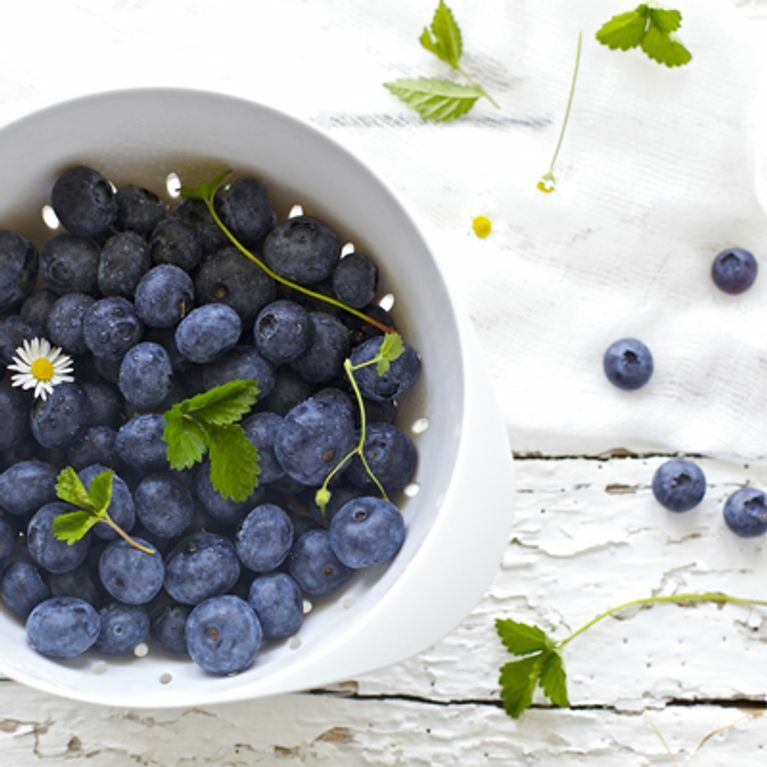 Blueberries are the answer to most things healthy but did you know that they can help protect against varicose veins? Us neither. Fiona says: "Blueberries, strawberries, and raspberries contain phytochemicals, (which are plant chemicals that have protective or disease preventive properties) which help to strengthen the walls of tiny blood vessels and can help to prevent thread veins." We know that omega 3 is great for general health but Sam explains it's also great for stopping skin from sagging. "Fish oil helps 'plump' our skin cells; a bit like the food-equivalent of a dermal filler - but only if you eat sufficient supplies each week . One of the most concentrated sources is smoked mackerel - it's even richer than salmon or non-smoked mackerel in terms of omega 3 fats," she says. Holland & Barrett nutritionist, Alex Thompson says that eggs do a lot more than satisfy your hunger. She says: "Eggs contain the highest quality of protein of any whole food. Protein is needed for growth and repair of tissues in the body, including proteins in the skin such as collagen and elastin which maintain the skin’s elasticity. Levels of collagen and elastin gradually drop in the skin as we age." "​It is important to eat enough protein rich foods to provide the building blocks to maximise the body’s production of these proteins." You'd think that a bean shaped like a body part would naturally be good for your body right? Well yeah. Kidney beans have a high amount of potassium, zinc and fibre which all help to keep your heart healthy by lowering cholesterol. That's not all though, weight for weight dried kidney beans contain as much protein as a fillet steak - who would have known? And are obviously a bazillion times more healthy on that heart. Good to know huh? There's no surprises here. Alex explains: "Tomatoes are rich in lycopene and beta-carotene, two carotenoids which have powerful antioxidant effects. These carotenoids have been shown to be particularly useful for neutralising free radicals produced from exposure to the UV rays in sunlight." They're also a major source of vitamin C so get stocking up on your toms! Tuna fish, like eggs, are a very rich source of protein. Tuna also provides omega 3 essential fats which are an important component of cell membranes in the body, including in the skin. Alex explains: "​These cell membranes are important for keeping the skin looking plump. Opt for fresh tuna rather than canned tuna though as the canning process removes much of the omega 3 content of tuna." You might not think it but broccoli and apples have a lot in common as they both have quercetin, but that's not the only reason apples are a health food to hang on to. ​Alex says: "They are also rich in a fibre called pectin which contains special types of carbohydrate called oligogalacturonides which have been shown to boost collagen production in the skin." And we all know how much we want collagen (naturally) in there. It's time to start bathing in this stuff, it's just too good. Fiona says olive oil is so good for anti-ageing because of its antioxidant properties like polyphenols and vitamin E.
"The benefits of olive oil can also be obtained through massage into the skin, and the plant oils within olive oil have excellent moisturising properties", she explains. Recent research around almonds has found that these tiny nuts do a lot more good for the body than you'd first imagine. With 20 percent fewer metabolism calories than originally thought, they're the perfect snack. Fiona says: "Almonds provide good levels of vitamin E, another antioxidant vitamin, as well as an abundance of flavonoids which have antioxidant effects. They are rich in zinc, the main mineral needed for collagen formation. They also provide one of the highest levels of protein for any nut, second only to peanuts." Although both the normal potato and sweet potato are great sources of fibre, which helps aid digestive problems, the sweet potato comes out top as it contains minerals that can help lower blood pressure and build healthy bones. "Sweet potatoes are rich in betcarotene which can be converted to vitamin A which is essential for healthy skin," says Fiona. In fact they have 400 percent of your daily vitamin A allowance. If you've been down to The Body Shop recently you'll know that brazil nuts are good for moisturising your skin, but that not all this nut can do. Fiona says: "​Brazil nuts area fantastic source of the mineral selenium which helps protect the skin against sun damage and age spots. Just four Brazil nuts will provide more than 100% of the recommended daily amount." Now we're not saying that everyone can go out and get high but hemp seeds, rather than the plant, are actually incredibly beneficial to anti-ageing. They're about one of the only edible sources of an anti-inflammatory omega-6 fat which helps with cell regeneration, gamma-linoleic-acid (GLA). Hemp seeds are also a great source of protein, which as you know by now, is a key ingredient to keep your skin firm and supple by synthesizing collagen and elastin in the skin! As if you needed another reason to chomp down some strawberries this summertime, Alex says that these tiny summer fruits are contain some of the best antioxidants called anthocyanins. These antioxidants help to neutralise the effects of free radicals. But what's the problem with free radicals? Alex explains: "These are unstable molecules produced in large amounts from exposure to environmental pollutants such as car exhaust fumes and cigarette smoke, exposure to chemicals, exposure to radiation, exposure to the UV rays from sunlight and also from heavy exercise.​"
​"Free radicals contribute to the ageing process by damaging hyaluronic acid, a protein found in skin which keeps it firm and supple. Strawberries are also rich in vitamin C, a key vitamin for collagen production and also with antioxidant effects." Tempted to try and add these healthy foods to your diet? Tell us what you think at @sofeminineUK. Brain Food | What are brain foods?